I was on the Texas Jump$tart Coalition, an organization to teach financial literacy, for several years. What we found was that not only in Texas, but the other 49 states as well, financial literacy is not taught in the public schools. Since we're not born knowing it, we need to teach it at home to our kids so they can get started off well in life. When you think about it, we really don't know the value of anything until we encounter it many times in life. Our kids aren't earing the money to run the household, nor are they paying the bills. They really don't have much contact with it, so they really don't understand it. When your kid comes to you and asks you to buy something for them, make them earn the money. That way they see that their hard work is what translates into dollars, not simply asking mommy or daddy for it. By the time they've earned the money, they may no longer want the item. Allowances are another way to let them see the value of money; it gives them a chance to see their time and hard work is what puts money in their pockets, just like when working for something they want. Let them know that the money they have in their hands is theirs and it's real. It has to be treated responsibly; they have two choices: spend it or save it. If they spend it, they will no longer have it. If they lose it, or it's stolen, they'll learn real quickly how elusive it can be. Do not replace it if it's lost or stolen; they need to find out what happens in "real life." 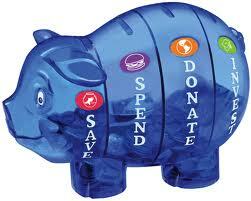 Opening up a savings account is a great way to encourage saving. They can see how interest accumulates and it's really cool to them when they see their money grow without doing a thing. I've always believed when you throw out to the cosmos, the cosmos throws back. Multifold. Giving some of their allowance to Unicef is a great opportunity. When I was in first grade a classmate had a birthday party and we were all to bring a gift, but it didn't go to Jerri, it went to underpriveledged kids. That was over 45 years ago and I still remember it. Perhaps they can give away toys they no longer use. What are some of the things you do so your kids won't grow up without a clue about money? Newer:4 Ways To Grow Your Emergency Fund FasterOlder:Debt: Should I Get The Old Stuff Off My Record?